After weeks of horribly intense humidity the seasonal rains have finally begun bringing relief for a short time anyway. Now this is a funny situation how it will affect fishing in our area. The rains in the mountains that surround Puerto Vallarta are just full of all sorts of stuff that will wash down in the river. Roots, stumps, trash and tons of organic plant ¨stuff¨ like seeds, leaves, you name it. This ¨stuff¨ that washes down the mountains, into the rivers and ultimately runs into the bay is great for the guy who wants a short day and plenty of action. Yes folks the Trash line is back. So, what does this mean, well the ¨trash line¨ is like a ribbon of crap floating in front of the river mouths, which will push out deeper in the bay as the days go by. But the trash line is a divider between dirty water full of mountain sediment and the clear / clean water in the bay. Where this ¨dividing¨ line is, is where you want to be. With all sorts of species coming into the bay at this time of the year you can literally just toss a Rapalla or diamond jig on the clean side and boat Dorado, Snappers, Bonito, Roballo, if you can imagine a species we have, you´ll most likely come across it on the trash line. Now some days are better than others, but for the person looking for a four hour trip in the bay, well there´s plenty of action just waiting for you now as we speak. While we don´t exactly love the dirty water in the bay, tourist hate swimming in it, but don´t be discouraged, it´s conditions like this the experienced fisherman will look for. So be happy and get on the water amigo! Things have calmed down with the cold water for now. Dorado are moving back into Corbeteña running over 35 lbs, Cubera Snappers were taking surface baits for a while last week, but this seems to be tapering off. Striped Marlin have moved out and we´re seeing Black Marlin in the 450 lb range back in the area. Now Yellowfin Tuna are not exactly abundant here on the rock right now, but if you´re willing to do some trolling to the west of Corbeteña from five to fifteen miles, you´ll find 80 to 120 lb Yellowfin Tuna amigo. No special secret here as usual, Cedar Plugs have been working well, even if they´re the oldest ¨plug¨ you can use as a lure, they´re still cheap and hard to beat. Blue water with water temps right at 80 degrees is a step in the right direction. With some luck you´ll find Wahoo and Sailfish as well. Corbeteña is well worth the fuel dollar right now amigo. It´s summer, Monster Time! El Banco or The Bank as we call it in English has been less than spectacular the last few days, but things should improve shortly. The Marietta Islands have been it´s normal and amazing self. Bonito, Skip Jack tuna in the 35 lb rang e is enough to keep anyone happy. 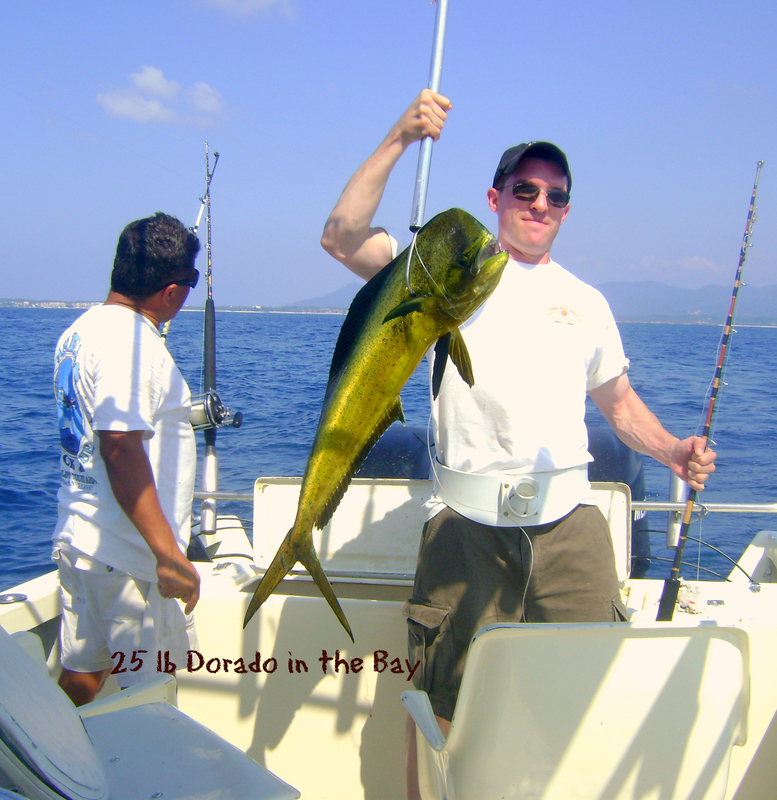 But there are also 25 to 35 lb Dorado hanging just off the reef. Rooster fish have disappeared again. Red Snappers have been schooling, some areas out there between El Morro, Corbeteña and the Marietta Islands, the golden triangle as I call it, is seen parking lot sized Snapper Boils. Great tasting, fun to catch, you could do worse amigo. Oh, Sailfish are picking up in numbers both at the Marietta Islands and around it´s close neighbor El Morro. You still need an eight hour day to hit this area, but it´s always worth the effort! 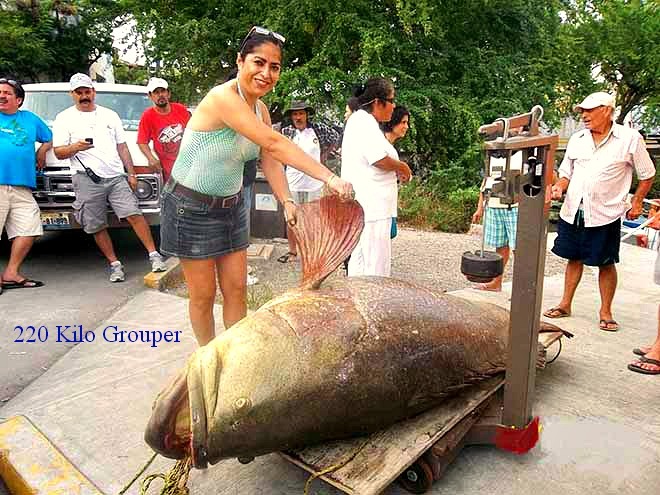 For those who think there are no Grouper in Vallarta, here is a picture of a Giant Grouper boated in Nuevo Vallarta at the river mouth. This 220 kilo Grouper is roughly 484 lbs and it was caught fifteen minutes north of Vallarta by row boat, in the bay of course, a local now has a fishing tale worth listening to. All and all, the fishing is still a mixed bag and we still have cold streaks in the bay and around the Marietta Islands. But this is summer fishing amigos and it will now only get better by the day. Those looking to have an arm burning fishing day, remember you first have to get out there! You really haven´t seen Vallarta is you haven´t been on the water! The seasons are changing to our normal warm and humid conditions. With these warm weather conditions comes warm weather. To be specific it means we have our annual surge of warm water species (fish that is) moving into the area. 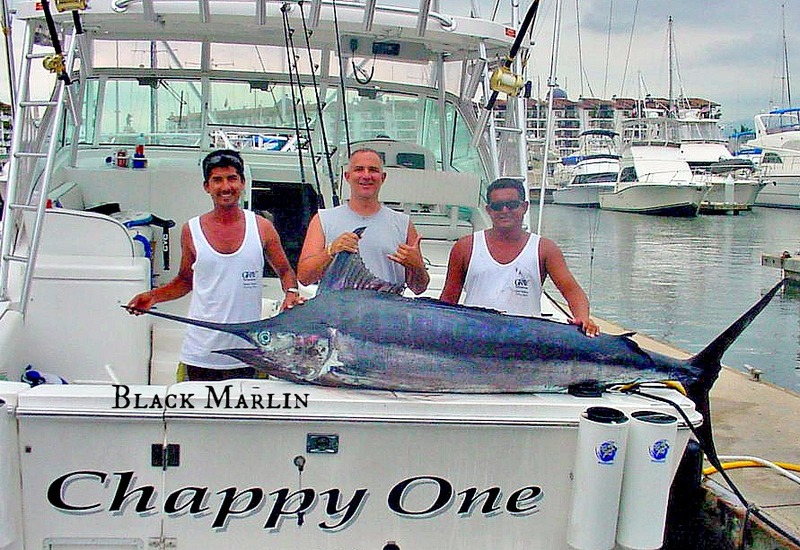 This season is no different as we see an increase in Blue and Black marlin. Striped Marlin dwindling in numbers as they migrate north to Cabo as would be expected. Some local-ish Yellowfin Tuna action is welcome and right on time. To me it´s always funny how as tourism slows to a crawl here in Puerto Vallarta as our world famous fishing grounds explode with bucket list fish for the vacation adventurer. Streaky bites, changing currents, and plenty of bait in the water makes for an interesting combination of factors that combined make your fishing day unique. Dorado at the buoys, the commercial guys hate me telling you this, have been hot and then cold. Some days you´ll find your fill of fish, other days they don´t want your bait and still other days…., well you could spend a lifetime trying to understand seasonal fluctuation both normal and unexpected. For the guy who will not go out fishing for more than four hours, you´re in luck the bay fishing is improving. For the last several months Jack Crevalls were the main player in the bay and around the area since they love the colder water temps. Last week we still had some Jack Crevalls in the cooler currents, but that has changed now and there are none to be found locally. When you see Needle fish and Sierra Mackerals move into the area you know the cold currents are coming to an end as summer fishing is upon us. For this reason the younger set will love catching smaller yet strong fighting fish. Bonito, Skip Jack Tuna at the Yelapa end of the bay. Snappers around the rocks and close in structure. With their numbers increasing this is what you can expect for now. No smaller Dorado except for freak occurrences for now, but stand by, this will improve as well. Those heading out a little farther to the Marietta Islands and the area off Punta Mita will find things have improved since last week with Rooster fish coming back into the area ranging 20 to 50 lbs and they´re hungry. Bonito, Snappers both running in the 30 lb range are increasing in numbers daily, again as we would hope and expect. Dorado are a little sparse around the islands, but there are off Punta Mita point, just find the buoys and you´ve got dinner amigos. 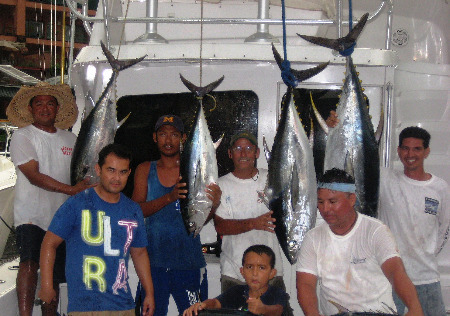 Bonito, Sailfish and Skip Jack Tuna are there as well. The Presence of Rooster Fish is enough for many of my regular readers to get excited about… using light tackle is recommended for an additional adrenalin rush and fight. Limited on time and vacation dinero, then this is a great option amigo… YeHa! For those looking for Yellowfin Tuna, closer in than the Tres Maria Islands, El Banco is showing signs of life with 80 to 120 lb Yellowfin Beauties. Cubera Snappers for the bottom fishing guys, other species as well. You may get lucky and find a stray Wahoo or two, no promises. For now you have better options. The best fishing option right now is the abundance of Black Marlin and Blue Marlin at Corbeteña. For some reason they´ve just rolled in and they´re feeding on Bullet Bonito. Bullet Bonito are Yellowfin Tunas favorite as they are shaped like eight inch fish, Oh and we´ve got 80 pounder Yellowfin Tuna all over the place. No Dorado this past week and you will find Sailfish as well. Just get some of those bullet Bonito and you´ll be fishing in a barrel amigo. Corbeteña, when it´s firing is incredible and deserves it´s reputation as one of the best fishing locations in all of Mexico / World! The bite, the most important thing to know if planning your day on the water is happening before 12:00 and after 5:00 in the evening. So early morning departures are preferable if heading to the deep water locations, including the Tres Maria Islands on a one day trip. You’d be better scheduling a later in the month trip when the moon phase if more favorable to your particular situation. Overnight trips are what the doctor is ordering if serious about boating Yellowfin Tuna over 250 lbs amigo. You can have your fantasy, but it´s gonna cost you! I am going to write some separate articles and post them on my blog, but for those who have not heard Marina Vallarta is now under new ownership and things are already changing. An interesting situation exist with the boat owners in Marina Vallarta with an uncertain future changes that are inevitable. I am hearing all sorts of things, some are a little disturbing. One of these changes will naturally result in new docks or Muelles in Spanish. This means at some point ALL the docks will be replaced which means of course all the boats will have to leave their present dock or Muelle in the near future. If you have a lease, it´s expired, end of story. The new owners are meeting with present dock owners and informing them of the changes coming down the road. The reason I am mentioning this in this article is because there is only so much dock space in the Puerto Vallarta area and that will dry up quickly and increase in prices as expected with the changing market conditions. My suggestion would be to move your boat as quickly as possible to Nuevo Vallarta Marinas or the La Cruz Marina before the rush hits. Many boat owners are pitching the words ¨law suit¨ around pretty loosely. Remember, a lease is not ownership. If your lease has wording that suggest you have the dock in perpetuity, you are looking at a tough battle. You will find this expensive, long lasting and ultimately you will wind up on the short end of that law suit. If you have a slip or own one, I suggest you attend the meetings and get informed. If you don´t know of the ¨whats and wheres¨ details for these meetings I suggest you contact the Marina Office and find out what is happening. Everyear we come to expect certain things. But after a few years of really up-side-down fishing, I have learned, with many others, it would be easier to predict what my ex-wife was going to do next. Normally what is happening now, happens in April. Some days the fishing is incredible, other days will have you pulling your hair out. 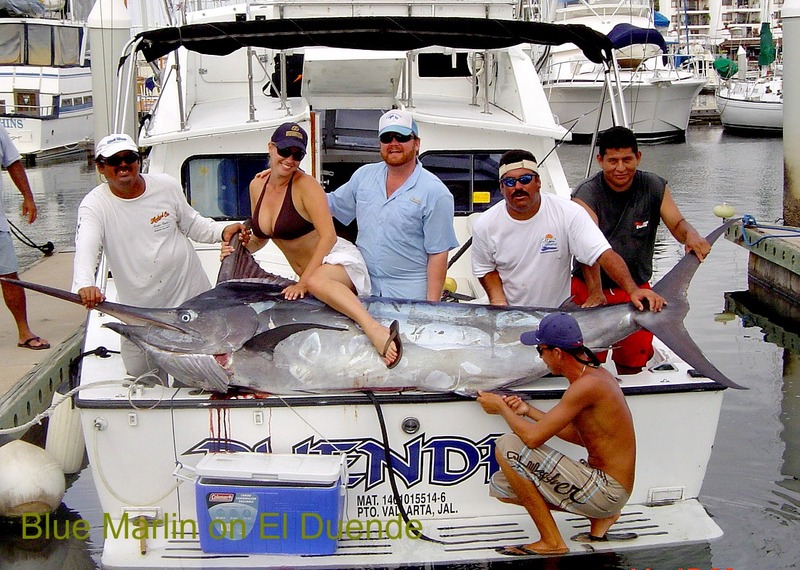 Having said that Striped Marlin are all over the deep water locations with Bull Dorado. For now the fishing is great, but not every day. If you are looking for some real action you´ll have to hit places like Corbeteña, El Banco or the Tres Maria Islands, or in between! Basically there are Striped Marlin throughout the area, but not on the rock or on the high spots. But if you have a little fuel left in your tank, venture out a few miles to several and you´ll find Striped Marlin and may have a shot at a Black Marlin. Not that Black Marlin are prevalent, but water temperatures are climbing, as a result Black Marlin will increase by the week, I think.. Ok, I hope! Be patient. Also Bull Dorado are around the the area, especially if you can find a floating clump of weeds or a log or even plastic bag trash. Maybe if lucky, you´ll find a buoy and the Dorado will be abundant. But if you´re expecting this to be automatic, it won´t be. Cubera Snappers at both Corbeteña and El Banco if you don´t mind jigging. Bait is not an issue, in fact there is so much bait out there you may not find a bird interested in them. Not much else really to speak of, Spinner Dolphin have become sparse, so Football Tuna are out. 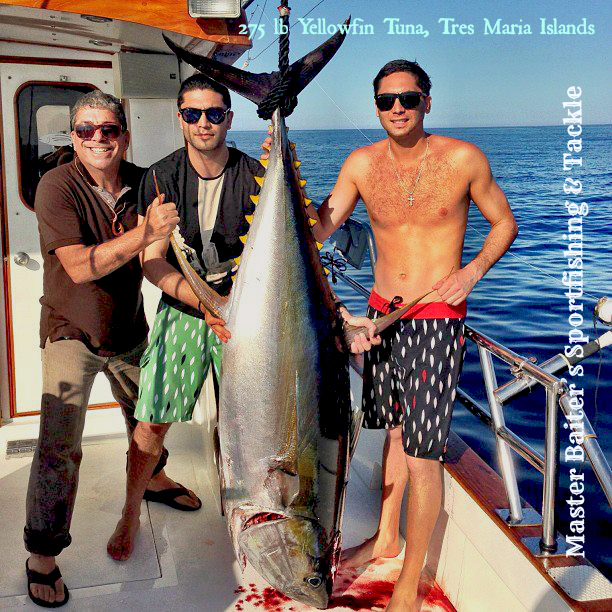 The Tres Maria Islands are your only shot at getting any sizeable Yellowfin Tuna. Now you´re looking at six hours in one direction to find these explosive fishing grounds. So I suggest an overnight trip at the very least to use your best option. Multiple days are a better choice. 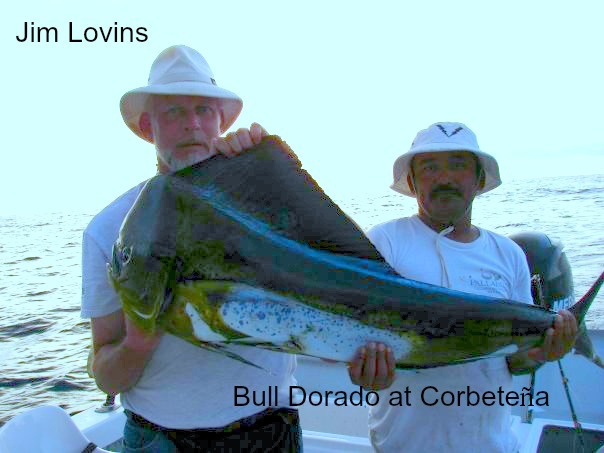 If you are at Corbeteña and you´re heading to El Banco or vice versa, make sure you don´t just get there as fast as possible, keep an eye out for buys where there are Dorado Bulls that will amaze you. Inside the bay, the fishing is weak at best. With Needle Fish moving in they are the dominant species at this moment in time. Jack Crevalls have moved out mostly, you will still find some in the colder currents. Sierra Mackerals and some other minor species are available. Bonito, Skip Jack Tuna are at Yelapa. For now I would not suggest any trips under eight hours. Tons of bait everywhere, with no preditors. The Marietta islands have signs of life, but it´s not going to impress the jaded. 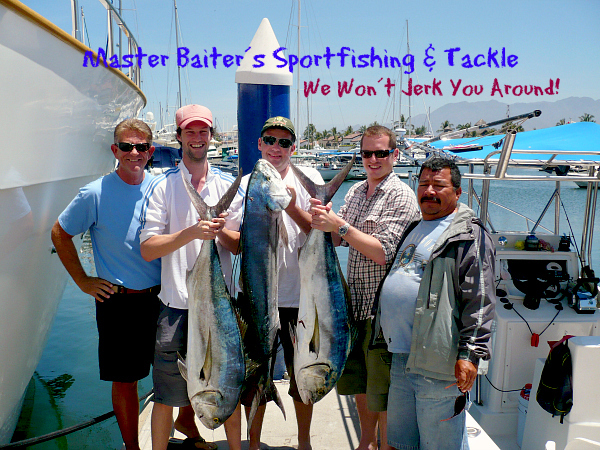 Skip Jack Tuna, Bonito, smaller Dorado, possible Rooster fish and a host of others to choose from, other than the longer distance locations, this is a good option. Plenty of bait in the areas, mid sized blue lures with tiger prints will work as well. But live bait is king amigo. Not many boats hitting these closer in areas so you´ll have the are pretty much to yourself, a real luxury if you ask me. Then again as the seasons change, these fickle fined friends of ours can change their mind in a second as love and mating season is moving in. It will blow your mind to hit a fish in his head with a bait to have him ignore it worse than my ex ignores me! That´s brutal! With tourism slowing to a halt, fishing is wide open with fishing companies begging for business. Just remember this is Mexico and you need to make sure the things you need are there. No radio, safety equipment and if they´re heading out at a slow pace, then you have a pirate boat. If there is no radio on the boat, but the captain has a cell phone, this is not acceptable. What is this guy going to do, call his mother in law to have the navy come find him?? If the boat can´t afford a hundred dollar radio, it will not be ¨alright¨. Especially if you are taking family and they get hurt or worse. Be smart, be safe and don´t look only at price. Know where you are going fishing and only make token deposits. Half down can mean you just got screwed, especially if the price is too good to be true, let alone believeable. If you can´t find the guy at the meeting place in the morning, which is more common than you may think, greed got the better of you. Be safe and don´t let price interfere with safety! There really wasn´t much to report this week, we´re in a dull period before things start rocking again in mid June. With water temperatures all over the place and strong, conflicting currents, anything is possible. Bait is moving in nicely and the bay is just stuffed with bait fish. Not too many species seem to be interested in what the bay is offering for now. But the simple fact is whatever conditions we are having, it will be just a few days before everything changes again. So remember, fishing is a risk sport, you risk your money and time for the possible chance of a life time to boat that bucket list fish. If it was automatic, it wouldn´t be called SPORT fishing.